I’m feeling kind of sportswritery today! And since that gig doesn’t take all that much talent – you simply have to be able to make strange proclamations with no sense of continuity from one column to the next – I’m uniquely qualified to step right into those shallow shoes. Not only that, but just as Da Coach used to preface his perspicuous points with that two-word preamble – “in life,” sports clashes are a wonderful metaphor for so many of the struggles this existence tends to thrust upon us. A football season is nothing more than a lifetime on fast forward. So here’s what we can take away from yesterday’s Bears – Bills debacle and why this is the beginning of the end for Marc Trestman. 1. Ya gotta honor the game! Trestman clearly believes he’s smarter than the game and the dangerous thing is he harbors the unique capacity to get his players to buy into that utter improbability. Though after yesterday, I’m thinking the team are finally catching on to his brand of bleep. Football may have changed quite a bit over the years, but the fundamentals have not. It still starts and ends with handing the ball off to the halfback or getting the split end to run a consistently crisp route. Even the most innovative coaches like Bill Walsh, Don Shula or Tom Landry implicitly understood the game existed long before they appeared on the scene and it will endure long after they’ve departed. If you don’t pay the appropriate respect to all those folks who came before you, then you’ll be the one who won’t last too long. 2. Ya gotta be prepared! And the Bears clearly were not. Trestman thought he’d outwit the rest of the NFL by barely playing his starters throughout the pre-season. He didn’t play them at all in the fourth game and then he let Lance Briggs skip the last week of practice. There’s a reason they have four full exhibition games, and one of them is so the players have the time to mentally and physically prepare for the rigors of a NFL season. These tests also provide the perfect opportunity for the offensive and defensive units to gel. Stripped of that opportunity, the highest paid players made the biggest mistakes, the entire defense was a step out of sync, there was no pass rush, and Jay Cutler looked like a third string quarterback on a bad day. He couldn’t roll out and his passes were wobbly, off-line and short. Of course, you don’t want to take unnecessary risks with your best players, but how does letting a star player out of practice do anything build the kind of camaraderie necessary to win in the NFL? 3. Ya gotta call the right plays! In the very first series, the Bears took it right down the Bills’ throat and scored. But then, as if to prove just how smart he was, Trestman decided to go with cutesy crap like a flea flicker and bubble screens that fell completely flat. You use gimmick plays when you’re the underdog – not when you’re expected to win. Despite the fact that Forte was having a really good game – when the Bears finally got around to giving him the ball – Trestman kept going back to Cutler who’s mind clearly wasn’t in it. That said, the Bills could not stop those quick slants across the middle where Cutler didn’t have enough time to think about screwing it up. So what did they do in overtime? Start passing to the outside again. 4. When they try to hand it to you, ya gotta take it! As is so typical of second tier teams, whenever they get a decent lead they’ll do their damndest to self-destruct. And the Bills were no exception. They managed to amass nine penalties for 108 yards, including. a stretch of seven straight fouls with two unnecessary roughness calls that really were totally unnecessary. Once you have a team on those kind of mental ropes, a veteran group like the Bears should be able to put them out of their misery. But no! They couldn’t even get excited about the way the Bills were manhandling them. Even when he was no longer returning kicks for touchdowns, Devin Hester provided Cutler with the kind of field position that most NFL quarterbacks could only dream of. When you’re consistently starting out at the 50 yard line, both the coach and quarterback can start to believe they’re real geniuses. I understand salary cap issues, but considering what a good return man can do for a team, I don’t understand how Trestman gave that prospect such short shrift. He gave everyone but the trainer the opportunity to return pre-season kicks and Senorise Perry certainly ain’t the answer. Yes! He had one decent return yesterday, but it was against Buffalo whose special teams finished near the bottom last year. 6. Ya gotta have respect or at least make ‘em fear you! The Bears were absolute ball hawks at the beginning of last season. The opposition both respected and feared them. But then Marc Trestman put his imprimatur on the team and suddenly it was the Bears who were coughing up the football. When you get to the top level of any sport, the game becomes far more mental than physical because the talent disparity becomes so slim. Thus, your capacity to intimidate your opponent os a critical factor in winning those close games. The problem is, the converse is also true! So now, instead of fearing the Monsters of the Midway, the 49ers are salivating over the prospect of playing this sad bunch and it’s gonna be a massacre. The bottom line? With their schedule, the Bears will be lucky to go 5 – 11. 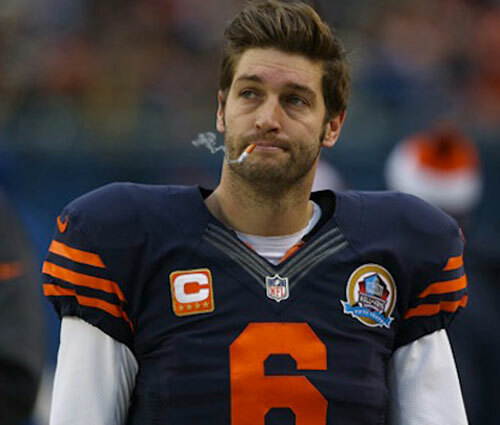 Frustrated with (and blaming) everyone but himself, Jay Cutler will go down with some sort of tenuous injury, and Marc Trestman will last one or two seasons beyond this one. And then the Bears will gleefully hire another really bad head coach. ← What’s in a name? Apparently a lot when you’re at the ER! Profound and oh so correct. My thought was the Bears would either be great because they are Geniuses or terrible. What 5 games will they win? They have a shot at #1 draft choice.